A common misconception about innovation is that it’s all about technology; it’s not. So, if your job doesn’t have you occupied with developing or implementing the latest and greatest in bleeding edge technology, or if you’re in a job that’s operational in nature, you may wonder how to be an innovator. We’ll explore these actions in the following paragraphs. Creativity fuels innovation. As individuals, we need to bring our creativity to work: it’s what allows us to use our imagination to connect to new possibilities. Creativity drives creative thinking and without creative thinking, we can’t drive innovation. Here’s the sad thing about creativity: when asked, most people don’t think they are creative – they think of creativity as something artists do. What they don’t realize is that creativity is about the attitudes we have, the beliefs we hold, and the ways we think. For me, creativity is an attitude that transcends paradigms and beliefs. It’s a soul-level yearning to fulfill a purpose, uniquely contribute, and leave a mark. Given these definitions of creativity, it’s easy to see that, in reality, all people are creative. And, regardless of our level of ability, creativity can be enhanced – it is teachable, and it improves with practice. Here are a couple of ways to connect to your own creativity. Interesting research conducted by G.A. 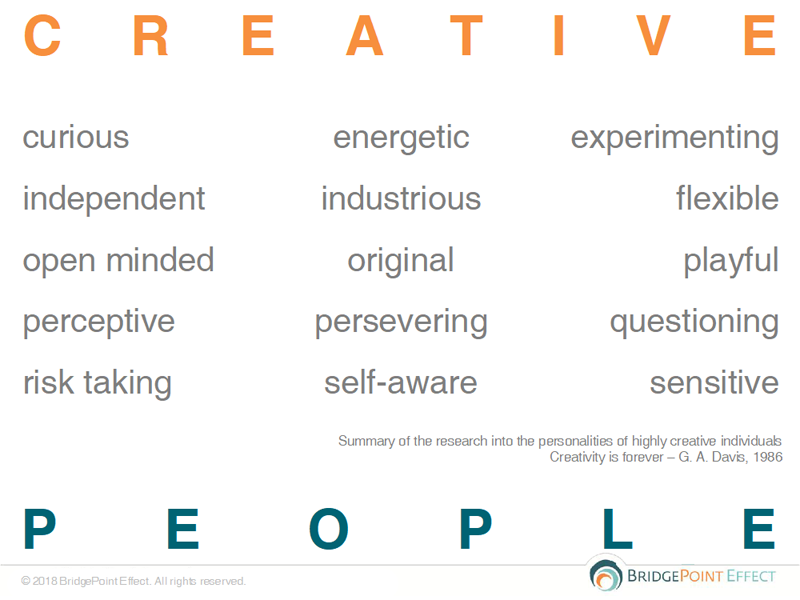 Davis (1986) summarized the personality traits of creative people. Here’s what he found. Creative people are curious, independent, open-minded, perceptive, risk-taking, energetic, industrious, original, persevering, self-aware, experimenting, flexible, playful, questioning and sensitive. Surely you recognize yourself in some, many, or perhaps even all of these characteristics. Creativity has hit mainstream and is now recognized as a critical skill for children, leaders and employees alike. Get Time Magazine’s 2018 Special Edition – The Science of Creativity. Check out our article on Reading for Creativity for references to some great books that can help you connect to your creativity. New research by Harvard University Professor Francesca Gino builds the Business Case for Curiosity. Her research highlighted important insights about curiosity and its relationship to innovation. Cultivating curiosity helps us adapt to uncertain market conditions and external pressures. We’re living in a VUCA world – one that’s volatile, uncertain, complex and ambiguous. When we use curiosity to approach challenges, we view tough situations more creatively, find more creative solutions, and think more deeply and rationally about decisions. 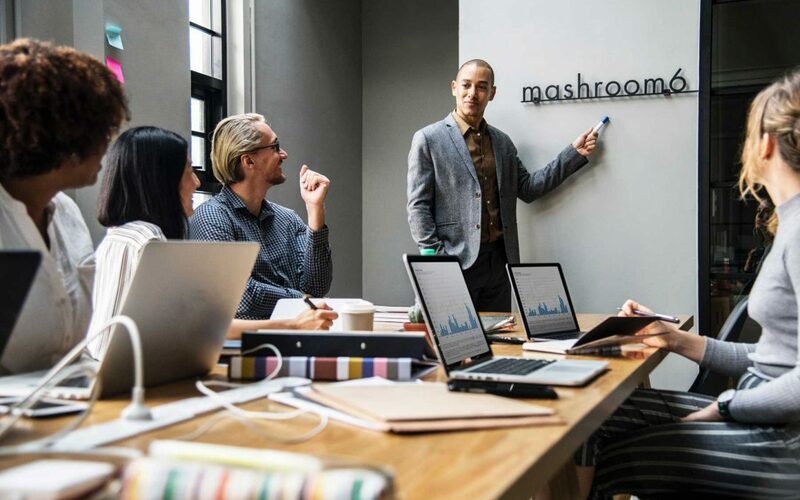 On the job, this translates into fewer decision-making errors, more innovation and positive changes in both creative and non-creative jobs, reduced group conflict, more open communication and better team performance. We use observation skills to gain information and tap our imaginations by observing someone or something. Observation skills allow us to go beyond the obvious. Honed well, they allow you to fully engage with your external environment by noticing what you see, hear, touch, smell and taste, as well as engaging with your internal environment by noticing how you feel about a situation and what your intuition tells you. Here are some ways you can develop observational skills. Research conducted by Puccio, Mance, Murdock (2011) at the International Centre for Studies in Creativity identified mindfulness, sensitivity to environment and sensing gaps as critical creative problem-solving skills. These skills support your ability to observe what’s going on around you. “Mindfulness” is defined as attending to thoughts, feelings and sensations relative to the present situation. “Sensitivity to environment” is about having an awareness of your physical and psychological surroundings. “Sensing gaps” is about becoming consciously aware of discrepancies between what currently exists and is desired or required. The MIT Office of Digital Learning has developed an online resource called Improving Observation Skills. 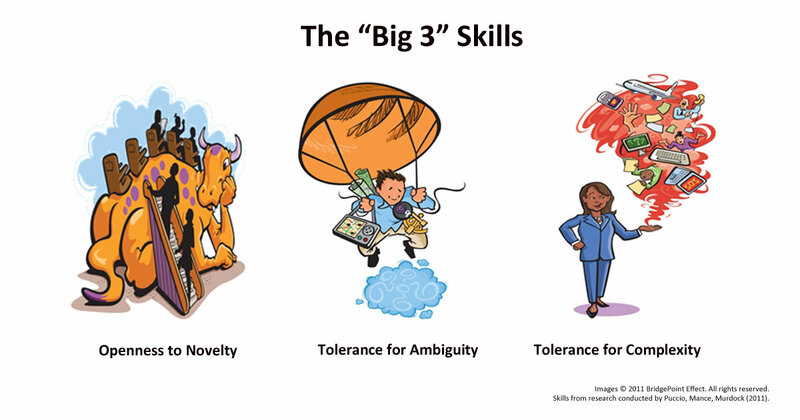 In the innovation world, openness to novelty, tolerance for ambiguity and tolerance for complexity are known as “the big three” skills. Master these skills and you’ll be an innovator on the innovation fast-track at work. Openness to novelty is having the ability to entertain ideas that at first seem outlandish or risky. It’s about deferring judgment, staying open to possibilities and remembering that innovation involves risk-taking because you’re changing things. Tolerance for ambiguity is having the ability to deal with uncertainty and to avoid leaping to conclusions. Tolerance for complexity is having the ability to stay open and persevere without being overwhelmed by large amounts of information, interrelated and complex issues, and competing priorities. The Conference Board of Canada sponsored research with industry and government to isolate the unique contribution that an individual’s skills, attitudes and behaviours make to an organization’s innovation performance. To learn more about how to be an innovator and how to teach creativity and innovation skills to teams in your organization, book a complimentary 30-minute consultation with me using the form below.